Having been left with a headache in the wake of last year's announcement of Publicis Groupe's withdrawal, this year's pared-back festival aimed to dispel some of the concerns surrounding its format. As the hardiest of revellers finally dragged themselves from the Gutter Bar at the conclusion of Cannes Lions in 2017, they could not have foreseen that the hangover from the event would last for many months to come. Reeling from Publicis Groupe’s decision to suspend all participation in industry events and awards for 12 months, as well as attacks from then-WPP boss Sir Martin Sorrell (more on him later), Cannes Lions-owner Ascential had little choice but to give the jamboree its biggest makeover in years. Shorter in length – lasting only five days, from Monday to Friday – and shorn of several awards categories, even the new, more humble Cannes Lions could not avoid a kicking from agency holding groups: awards entries were down 21% year on year, while Omnicom and WPP claimed to have sent 20% fewer people. Ascential tried to put on a brave face, with chief executive Duncan Painter arguing that the holding companies have found the "right level [of participation] for them". Yet gaps on the previously jam-packed beach and marina, and the absence of Snap’s garish Ferris wheel, suggested that even digital media and tech companies – a lucrative source of revenue for Cannes Lions – had pulled back from an event many argued had become bloated and brash. Indeed, there was a perceptible drop in numbers. A handful of keynote sessions aside, queues in the Palais appeared shorter than in past years, while increasingly desperate promotional emails suggested fringe events along the Croisette struggled to put bums on seats. Even after-hours, the usually undignified scrum to secure a place at parties failed to materialise, and performances by Kylie Minogue and The Killers could be enjoyed by early birds and latecomers alike. And what of Cannes Lions’ solemn promise to restore creativity to the heart of the event? Speaking to Campaign as the week unfolded, Painter insisted that creative teams were "still being sent in good numbers", and that it was media agencies that had reduced on-site headcount. A swathe of familiar faces on the Carlton Terrace (not to mention at Campaign’s 50th anniversary party) seemed to confirm this, even if a new "spirit of moderation and modesty", in the words of Adam & Eve/DDB group chief executive James Murphy, added a degree of temperance to proceedings. Yet clearly nobody had mentioned the renewed focus on creativity to Accenture, one of the dreaded consultancies making an incursion on adland’s most-hallowed turf. In a much-derided promoted tweet, Accenture Interactive invited users to vote for the most interesting topic of choice at this year’s festival, with the options including "brand transparency", "physical versus digital", "connected experiences" and – slightly embarrassingly – "awesome parties". Those senior creatives in attendance were able to enjoy a strong showing by the UK, led by Adam & Eve/DDB. The Omnicom shop flew home with an impressive haul of 27 gold, silver and bronze Lions for work including its "Trolling is ugly" campaign for Cybersmile. No sooner had co-founders Murphy and David Golding landed back in London than they had to turn around just in time to pick up a second Cannes Agency of the Year prize in only five years. Elsewhere among UK agencies, McCann London’s "Xbox Design Lab originals: the fanchise model" picked up the Grand Prix for Creative Ecommerce, while Wieden & Kennedy walked away with a Grand Prix in Social & Influencer for its irrepressible "Nothing beats a Londoner" film for Nike. Cannes Lions had made a big point of separating heartwarming charitable work from commercial categories, in the hope of encouraging juries to reward big brands. 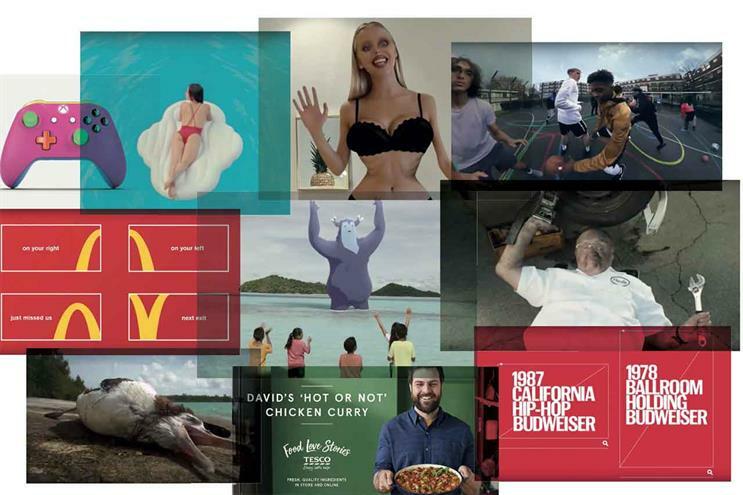 This succeeded, to an extent, with Grand Prix winners including Budweiser (Print & Publishing), McDonald’s (Outdoor), Tesco (Media) and Procter & Gamble’s Tide (Film). However, and perhaps inevitably, some of the most-talked-about entries remained purpose-led and not-for-profit campaigns. Abbott Mead Vickers BBDO was feted for its "Trash Isles" work for LADbible and Plastic Oceans Foundation highlighting plastic pollution, winning both the Design and PR Grands Prix. The agency also took away the Grand Prix in the Glass category for "Blood normal", the Bodyform campaign that became the first UK ad to depict actual menstrual blood. And the most prolific Grand Prix winner – picking up Direct, Sustainable Development Goals and Titanium gongs – was Host/Havas’ eco-tourism initiative "Palau pledge", requiring visitors to the Micronesian island to sign a passport pledge to act in an ecologically responsible way. If last year’s festival was largely blown out of the water by Publicis’ Marcel-themed thunderbolt, then the 2018 gathering lacked a dominant thread. The trend-topic du jour remained AI, with countless panelists offering nebulous predictions for how the nascent technology may affect marketing and society at large, while the rise of "cagencies" was debated ad infinitum as the rosé flowed. Sorrell tried his best to steal the show, as ever, as a last-minute addition to the conference agenda. He added some flesh to the bones of his new S4 Capital venture and bemoaned the lack of speed with which he implemented his "horizontality" plans at WPP but a resolute refusal to address the more salacious accusations about him in the press ensured his appearance was an anticlimax. Instead, and perhaps for one year only, the biggest story at Cannes Lions this summer was the festival itself. Would Publicis return in 2019? Does it still matter to agencies? And could it ever be superseded as the ad industry’s most important annual gathering? The answers to those questions – for now, at least – appear to be yes, yes and no. As the week drew to a close, Keith Weed, Unilever’s chief marketing and communications officer, told Campaign that he had been impressed with the new-look Cannes. An event that, he said, had become "too busy" and weighed down by "cost and complexity", now felt "more focused and less hectic". After receiving a bloody nose in 2017, Cannes Lions pulled itself back from the brink and ensured its short-term survival, even if long-term questions remain, especially about how it can balance the demands of its respective agency and tech stakeholders. Still, any hangovers should clear a darn sight quicker than they did 12 months ago.